As summer approaches, Muscogee (Creek) Nation Principal Chief George Tiger is preparing to see the RiverWalk Crossing come to life. Since the tribe purchased the riverfront development in 2012, Tiger has been putting the pieces together to bring the area back to its former heyday. Part of that plan is bringing entertainment and activities to the area over the summer months, featuring music acts and art events; the other part is finding tenants to fill the center. “We’re in the process of being aggressive with getting tenants for RiverWalk,” he says. Tiger remains focused on increasing the center’s retail options, which includes seeking out a large retailer to serve as an anchor for the development. But, whomever the future tenants turn out to be, “my main emphasis is to have a family friendly place that will allow people to feel comfortable about bringing their families to have a good time, whether that involves entertainment, shopping or eating,” he says. Besides RiverWalk’s staple businesses, including Los Cabos, The Melting Pot, The Cigar Box and Marble Slab Creamery, additional tenants have come to the area including Pinot’s Palette, Embroidery Designs, Nevaquaya Fine Arts, and businesses housed in offices on the second floor. 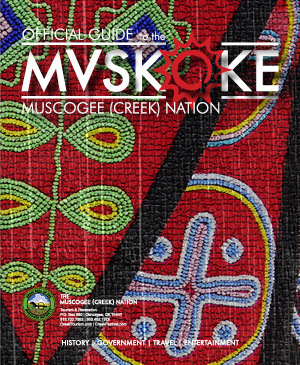 A portion of the second floor includes the Muscogee (Creek) Nation offices and soon to be added to that is One Fire, a holding company that the Indian Nation is currently creating. “One Fire will allow us to develop LLCs to get into retail and other aspects of business but still be under the umbrella of the Creek Nation,” says Tiger. Since becoming principal chief in January 2012, Tiger has quickly accrued accolades such as, in 2013, the Nation’s purchase of RiverWalk Crossing earned it the Business Deal of the Year award from the Native American Finance Officers Association (NAFOA). In April, NAFOA named Tiger the Tribal Leader of the Year. The award recognizes individuals who effectively lead a tribal nation and display foresight and resolve in the financial advancement of the tribal nation, according to the NAFOA website. The Creek Nation’s Margaritaville-themed expansion of River Spirit Casino and establishment of its community development financial institution were also reasons given for Tiger’s recognition. With the announcement of the Gathering Place development at the north end of Riverside Drive and the arrival in 2015 of the Creek Nation’s Margaritaville, there is nowhere to go but up, Tiger forecasts. “That area around RiverWalk and River Spirit is ready to explode economically,” he says. As the conversation turns to general river development, water in the Arkansas River naturally becomes the next topic. The Margaritaville project will include a 483-room luxury hotel with a spa, theatre and several restaurants, including Jimmy Buffet’s Margaritaville Restaurant and the 5 O’Clock Somewhere Bar. The development will also include a special events venue offering 30,000 square feet of convention and meeting space. It is estimated that, after the project is complete, the development’s annual economic impact will be an estimated $135 million. When Margaritaville is complete, Tiger expects to see it and RiverWalk Crossing “feed off each other,” he says, with visitors coming to the casino or to see an event and then shopping or eating on the west side of the river. Additional river development may be coming soon involving more than 30 acres of land north of RiverWalk that is also owned by the Creek Nation.